I've spent the past week doing so much cool stuff! I'm actually shocked of how productive I've been since my exams ended, considering my lack of sleep and my love for doing absolutely nothing at all. I slept over at my friend's house, saw my family, saw my friend's family, went to a party, went to a festival and then to a party and then I went to another festival. Between all of that I had to go to school to pick up some stuff and to drop off my books. My summer's been great so far, and I have a lot more things I want to do. Staying up all night, making a short film and eating s'mores to name a few. I don't have any outfit pictures for you today. I wanted to make another Exam Outfits post but there was a heatwave in Belgium and I basically wore denim skirts and tops all week which isn't interesting at all. 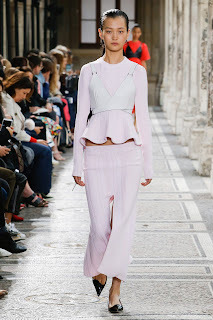 I was looking at some Spring 2018 couture shows from Paris and I decided to write a short post on my favorite collections. There aren't that many and I don't know if there will be more collections because I usually don't follow up the couture shows. Anyway, here we go. 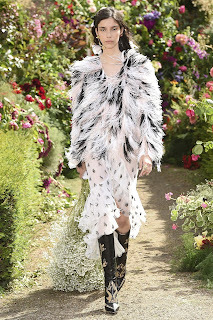 Rodarte gets me every time. I don't like this collection as much as some of their previous ones, but I couldn't write a post about my favourites and not include them. I just didn't like the bows on the belts and the other bow detailing at all (I honestly don't know why I hate them) and there weren't a lot of "OMG THIS IS SO AMAZING" moments. Maybe they're not my style anymore but one thing is for sure: there's some flower child realness going on here. 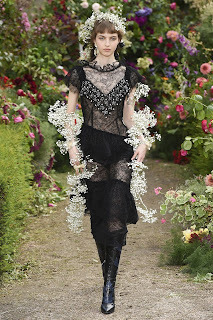 I just love how intricate and delicate Rodarte's designs are combined with simple colours like black, white and beige. This collection gave me serious California/desert vibes. 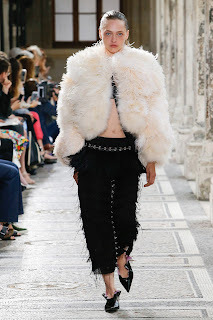 Rodarte's looks are the opposite of what I like to wear (I'm a trousers-and-shirts kind of girl) but their collections are just so nice to look at. Also, quick rant here. I feel like some fashion bloggers I like kind of put themselves above trousers. Like, I was reading this post and this girl was just going on and on on how she hadn't worn trousers in five years and that she hated wearing jeans because she didn't want to look boring and stuff like that. Honestly I think trousers are just as pretty as skirts and you don't have to wear skirts or dresses to look interesting. Trousers are underrated and some bloggers aren't giving them the love they deserve. I don't mean to criticize bloggers for wearing skirts because they like it, you're free to wear whatever you like, but I just know that when I read that kind of posts they made me feel guilty and boring for wearing trousers, so to my fellow trouser-girls: don't feel like you're boring because there's nothing wrong with trousers. Anyway, great collection. I LOVE PROENZA SCHOULER SO MUCH IT HURTS. Such a strong collection. I would totally wear all of these outfits if I (a) had the money to buy designer clothes and (b) if the only thing I did all day was going to fashion week because I refuse to get out of my sweatpants unless it's really important. The colour scheme is on point as always. I'm absolutely in love with that (fake?) fur jacket in the right picture and the white leather croptop worn over the long sleeved top. I don't know if it tops the fall winter collection, but it's certainly very close. 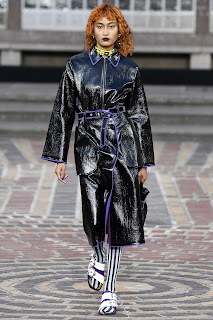 I feel like Kenzo just keeps getting better to be honest. Just look at that last outfit. 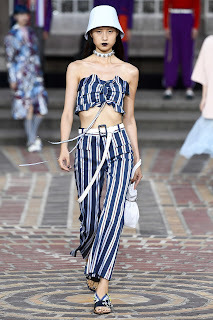 I'm totally digging the tube top and the trousers with that white belt. Funny coincidence by the way, because I've been longing for a pair of nice shorts that aren't too short and have a slightly boyish fit (Cato trying to find non-existing clothing items part 8137139) and I love how the shorts of the left look like with that white shirt, I'm thinking of buying a pair if shorts like that. 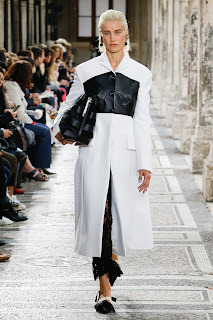 The leather coat took this collection to a higher level of coolness. I'm so ready for the leather coats and trousers trend to come back. Matrix-inspired outfits look so good. I love the shoes as well, especially since I own a pair of sandals that look a lot like these. I think the socks are questionable, but they work with the rest of the outfits.